Only you get our Confirmation e-mail after HW-Confirmation, what means your Booking is 100% GURANTEED!!! 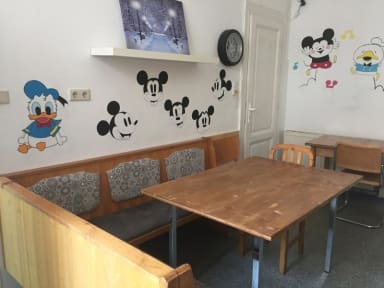 Welcome to Chichilli Hostel Vienna the only family run hostel in Vienna. We are located in the exclusive 19th district in a historic building. We have a home-like setting so you can enjoy our affordable rates and hospitality in this hostel, with easy access to nearby city center. Chichilli Hostel Vienna is an outstanding hostel in Vienna with a lot of great advantages. We try to give our guest best service. Our staff speaks English/German/Mandarin to assist you with your needs to get around Vienna and have a great stay. You will be staying in a historic Viennese building with a home-like atmosphere. The location is secure and you will have a key to access the hostel. The hostel is clean and welcoming. The easy access to public transportation with 'Guneschgasse'stop in front of hostel on Tram 37 and U-bahn 4 and 6, stop 'Spittaleau' connecting you to nearby city center. 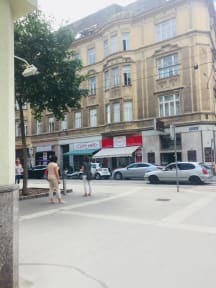 There are supermarkets and bakeries near by our hostel. A very famous restaurant the name is 'FISCH BRÄU'. You can trink the best brewed beer and typical foods of Austria there. We have 7 single rooms and several mixed-bed dorms with shared bathrooms. Each room has high ceilings, comfortable mattress and windows. There is a washing machine and kitchen available for guests. There are laundry facilities and cooking facilities available for guests. Check out from 00:00 to 10:30 . We do not have 24-Hour reception, so if you will arrive after 22:00, please email us to let us know. Late check in €3.00 charge and 1 Euro for the fresh bedline.